This beach ranks #2 of the "Best islands in Baa Atoll"
Finolhu Maldives is a new 5-star resort opened in 2016. The minimum cost of room is US$700 per night, but for the most of dates the price starts at US$900. This is expensive, but it's Ok for that superb hotel. The island is focused on active youth, trying to reproduce funky atmosphere of Ibiza - with modern music and evening parties. Even the main pool area looks like the beach clubs of Ibiza. Thus you'll get a true Maldivian vacation at its best, plus some additional bonuses unavailable on other islands of the Maldives. 1. Flight by seaplane. It takes half an hour per way. 2. Regular flight to Dharavandhoo island (20 minutes), and next ride by the hotel's speedboat (another 10 minutes). In both cases the cost for the return trip is 630$ for adult, 320$ for child 2-11 years old. Childs under 2 years old travel for free. 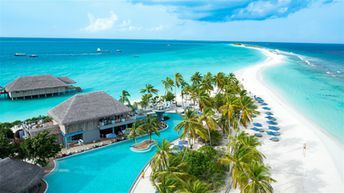 The best time for a beach holiday in Kanifushi hotel of Finolhu island in Maldives is a dry season from January to April. The rest of time it's a rainy season, that means a maximum 2-3 sunny days per week. However, the weather in the tropics is always a lottery. Sometimes, and it deeply rains in February. On the other hand, it may happen in August, that it will be only one short rain during the 10 days vacation.